Alfa Laval Aalborg is the world's market leader in supplying marine thermal fluid heating systems. 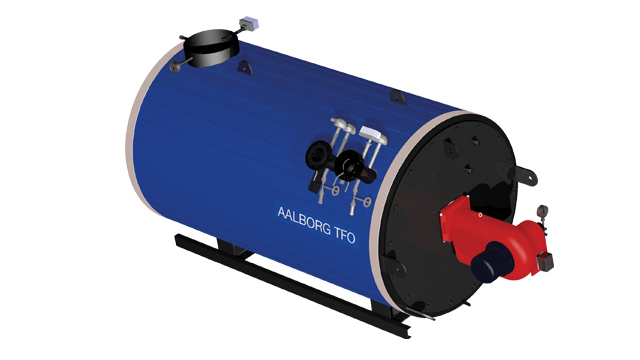 Within this product range is the Aalborg TFO product, which is a oil- or gas-fired thermal fluid heater. Alfa Laval Aalborg's thermal fluid systems can be supplied with an in-house devloped PLC-operate controle panel. Through the 12inch touch screen of this control panel, the operator has a clear overview of the complete heating system and its status. The different kind of field-bus connections for communication mean that connecting a second touch screen and/or connecting the system to a central alarm is very simple. Thermal fluid systems on ships are used to supply heat for various kinds of heat consumers like fuel oil tanks, separators and fuel heaters and to heat all types of cargo such as bitumen, oil products and chemicals. Also tank washing systems, steam generators and central heating systems are typical fields of application. In thermal fluid systems, the produced heat is transferred to the ship’s heat consumers by means of a transfer fluid, usually a mineral oil. Pumps circulate the fluid through the closed system, passing the fuel oil fired heaters and economisers. The fluid remains in liquid phase during the entire process enabling high temperatures with the lowest pressures possible. The simplicity of the system and the preserving nature of the oil makes this a very reliable and low maintenance solution. The system is easy to operate and due to the system design the thermal oil has a long lifetime.